Chinese medicine looks at the body as a whole system made up of smaller interdependent elements. When each individual functioning system of the body is working in harmony, health is achieved and maintained. When disharmony or weakness or injury occurs in one system of the body the entire balance and function of the body will begin to be effected. An example of this is the essential interaction between the heart and lungs or cardio-pulmonary system. An illness affecting the heart will eventually affect the function of the lungs. 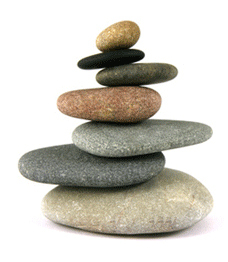 These imbalances are the very root of disease or dysfunction. Chinese medicine identifies imbalances in the body. It does so through a detailed patient history of inquiry, observation and even palpation. This detailed history is used to evaluate systems of the body and to determine energetic patterns that may have become problematic. Acupuncture serves as a stimulus to gently encourage the body to return to a more balanced state. Acupuncture can help strengthen the body to promote its own healing power. Chinese medicine is unique in its ability to create individually tailored plans to improve the immune system, reduce stress and anxiety, improve general health and vitality, and address issues of pain and injury. This also makes acupuncture a highly effective tool when combined with other western therapies and medicine practices. Chinese medicine is not a substitute for western care, but instead is a great enhancement and complement to western care. What’s the Qi got to do with it? In Chinese medicine the body is described as an energetic system. This energetic system is used to gain treatment results and this energy is called Qi or vital life force energy. Qi flows through the body along meridians or pathways. By stimulating acupuncture points along these pathways an acupuncturist is able to treat identified imbalances in the body. This stimulation of acupuncture points is used to encourage the body to shift out of or let go of an unhealthy pattern of being by redirecting the energy or qi. We can think of this energetic system of qi as similar to electricity. In fact, we learn in biology classes that every cell in our body carries an electrical charge. Western science has determined that acupuncture works by interacting with the nervous system. The nervous system itself is also quite electrical in nature if you examine it at its most basic level. Sterile disposable single-use needles are placed at selected acupuncture points to stimulate the movement of qi. The needle itself is a solid (filiform) thin stainless steel needle about the same diameter as a hair. Insertion of these needles ranges from painless to a brief discomfort. Deep relaxation is usually experienced during and after the treatment. Increased energy and a sense of vitality can also be experienced after the treatment. Anywhere from one to twenty needles may be used in a single treatment. Generally the needles are retained for 15-40 minutes while lying on a comfortable treatment table in a peaceful setting. The number of visits needed to work on a specific problem or health issue will vary per each individual. Several factors can be evaluated to determined estimated length of treatment. How Can I Use Acupuncture? 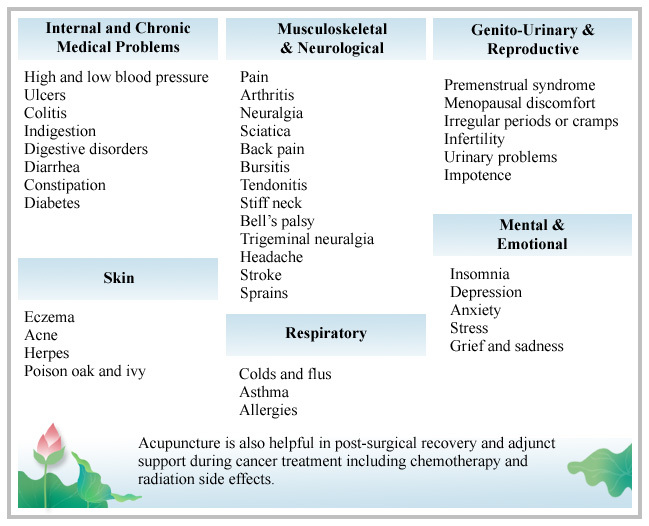 Acupuncture can address numerous problems. It is not fully known how acupuncture works. It is known that acupuncture has an effect on the autonomic nervous system. Acupuncture stimulates the nervous system and the nervous system effects the function of the entire body. It is because of this relationship that acupuncture can impact a broad range of health issues.